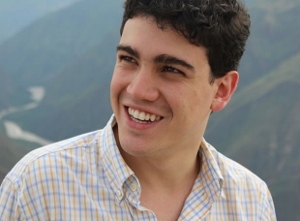 Twenty three year-old Juan David Aristizabal Ospina felt increasingly disturbed by the fact that Colombia’s media presented sensationalist information about conflict, violence and corruption. It also transformed drug traffickers and guerillas into heroes, by disproportion-ately focusing on them, while failing to highlight the stories of people bringing positive change for their society that could inspire citizens to take action. At the same time, he felt that the Colombians that were making a difference in society did not have a space to share their initiatives and to collaborate with each other. Compelled to take action, Juan David decided to create Buena Nota, an online platform that informs, engages and connects young Colombians to social problems and their solutions.The platform allows citizens groups and social entrepreneurs to present their projects to a wider audience of engaged citizens via notes, videos, the Buena Nota radio, as well as to elevate them to the national level. It currently draws its audience from four main groups: project leaders, who aim to enhance the visibility of their projects and collaborate with other change-makers; organizations wanting to support social change through their actions or donations; the around 3 million Colombians that Juan David estimates have access to the Internet and wish to learn how to be involved in social change; and the 4.5 million Colombians living abroad, who want to be involved in bringing change in their home country. One of the key strategies applied on the platform, the VICA method, aims to help leaders strengthen their social message, make it more visible at national-level and determine Colombian citizens to become involved. Juan David has also managed to create partnerships with businesses, funders and universities, in order to provide a wider platform for the social projects. Companies, such as Avianca, Publik, AVIATUR, Genesis Foundation, and Telefónica, have started collaborating with projects that they found on the platform. Buena Nota itself has landed an important collaboration with Compartel, a national initiative of the Ministry of Information Technology that will bring Internet access to five million people in the country’s most remote areas, by providing public computers. The company has promised its computers’ home page will be configured as Buena Nota, which will significantly expand the platform’s audience. Currently one million people are involved in the young entrepreneur’s platform in one way or another. If currently 23,000 new visitors enter the platform daily, Juan David hopes that, within the next five years, that number will reach 300,000. His long-term goal is to shift the paradigm in which Colombians perceive themselves, from victims to change-makers. In terms of funding, Buena Nota’s financial resources mainly come from advertising and corporate sponsorships, but, on the longer-term, the young entrepreneur hopes that the more of the revenue will result from commissions charged for online donations to the projects that the platform might feature. Juan David has also written a book, entitled “Llenando espacios,” which presents 16 remarkable Colombian change-makers, in an effort to raise their visibility and increase public in trust in them as well as to encourage everyone to have the confidence to take action and make a difference. Talking about his personal determination to be a change-maker, Juan David highlighted three key events in his life. The first was visiting his grandfather’s farm as a young boy and realizing that the farm’s children couldn’t attend school, as he did. He decided to record their stories and those of other children and share them stories in his school newspapers. The second was his parents’ repeated question to him: “How are you going to serve the world?,” which determined him to never stop working until real, widespread change has occurred. The last event was the death of one of his best friends in high-school. He had worked with Juan David on youth projects and was killed by a gang. His death determined Juan David to work hard to carry on the fight to bring change and determine others to do the same. Through his platform, the young entrepreneur is tremendously pursuing this goal.